There are 13 different bottle sizes. The larger sized bottles are produced in less quantity than the standard size bottle, and are always worth more than just double the price of the regular size bottle. Champagne is most popular and common in using larger bottles. 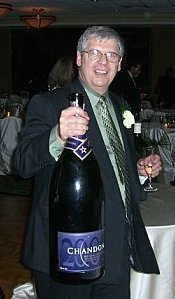 The magnum is a double sized bottle (1.5 liters) and is one of the best selling sized bottles for Champagne. Many California Cabernet Sauvignons, Red Bordeaux, and Red Burgundies are produced collected in these larger formats. 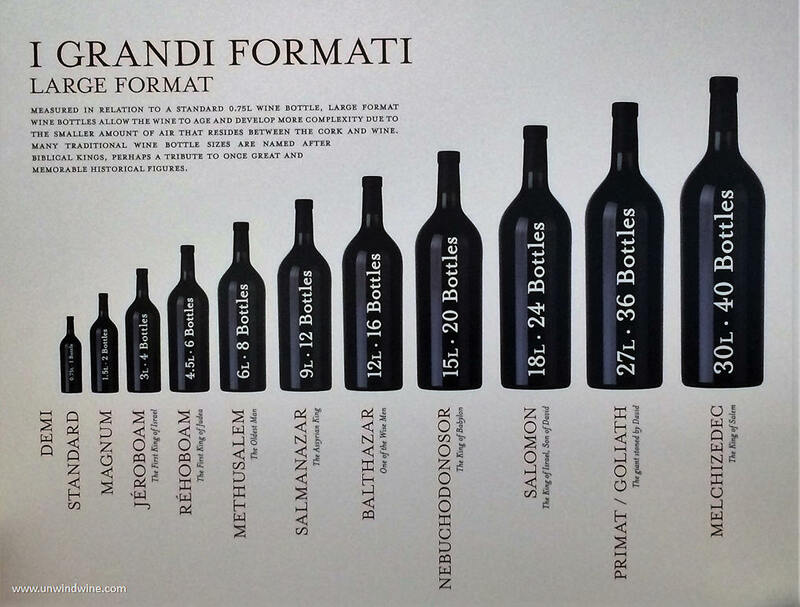 It is generally accepted that wine will age better - longer, more gracefully and uniformly in a large format bottle - hence their popularity with collectors. There is also great novelty and fun in opening and serving a large bottle. Often for special occasions, one will have all the quests sign the label of a large bottle as the labels are proportionately larger with the large bottles. See Rick's large format bottles, labels and large bottle feature in Wine Spectator Magazine. Made only for Sparkling Wine. MAGNUM 1.5 liters Equal to 2 standard bottles. DOUBLE MAGNUM 3 liters Equal to 4 standard bottles. 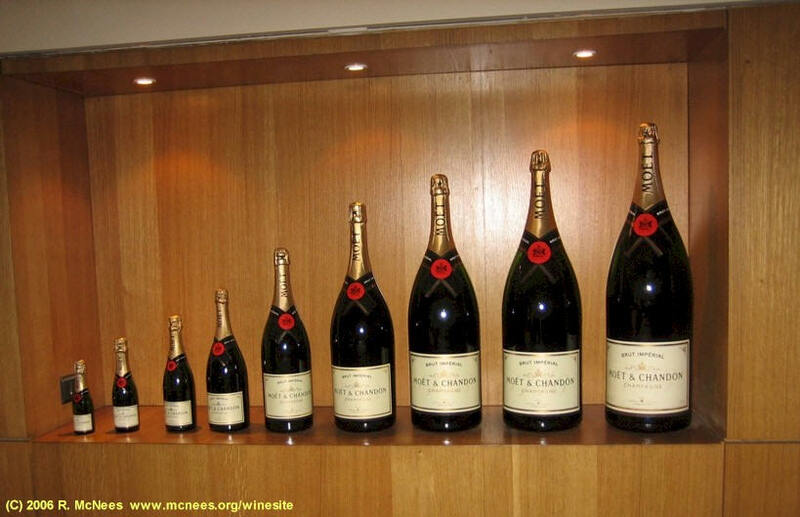 JEROBOAM - This is what Champagne and Burgundy call their 3 liter bottles. Equal to 4 standard bottles. REHOBOAM About 4.5 liters. Equal to 6 standard bottles. 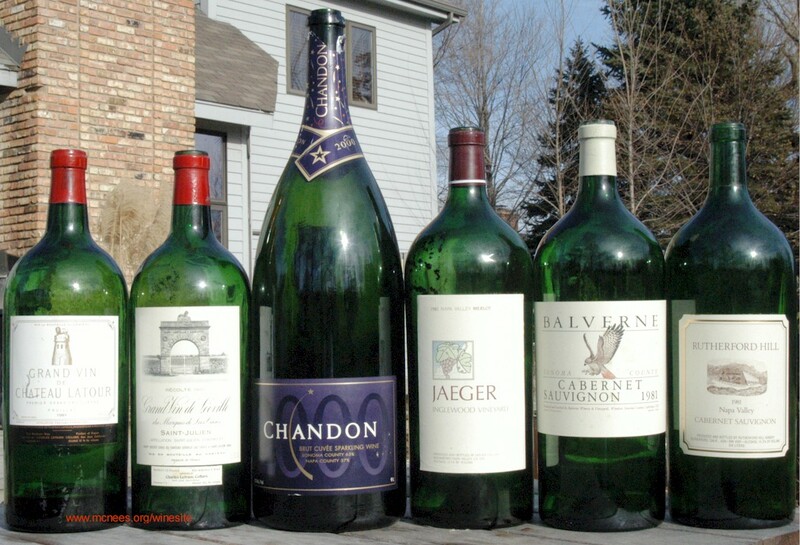 JEROBOAM 5 liters Equal to about 6 3/4 standard bottles. IMPERIAL 6 liters Equal to 8 standard bottles. METHUSALEM - This is what they call an "Imperial" in Champagne and Burgundy. This one is a case of wine in one bottle. Equal to 16 standard bottles. Depending on the country of origin this will be from 16 to 20 standard bottles. Not shown: 1981 Chateau Palmer, Lynch Bages, Ducru Beaucaillou, Cos' d_Estournel, Chateau Beaucatel and Silver Oak large format bottles.